With only one day to go until Valentines Day, most of us by now have a vague idea of how you plan to spend it, or in some cases get through it. In Marks & Spencer’s yesterday, I was feeling very smug with my bargain Valentines Dine in for £20.00 Offer (It’s amazing- a starter, main, side dish, dessert, bottle of wine AND chocolates for just £20.00. Sweet…who said romance had to cost a fortune?) but the girl serving me at the till quickly burst my love bubble when she groaned (aloud) and said “oh god, every other customer has purchased this today…the whole thing just makes me sick!” I’m guessing she wasn’t talking about the food…what a misog. But as much as I’m in love with all things lovely, the very thought of being squeezed into a restaurant with thirty other couples gazing into each others eyes, does make me cringe. I’d probably spend most of the night, not paying attention to the Hubster, but instead nosing into other peoples conversations and then feeding my pointless details and theories back to him. I wouldn’t be able to help myself, trying to suss out the secret lives of my fellows diners. Who’s hoping (desperately) for a proposal (I’ve been there)? Who is on a first date, how does it look like its going? Who is not really feeling the love? Oh who might be having an affair? Ooooh…who is having problems in the bedroom department? I’d have the whole room pigeon holed with a back story before my main course arrives. I need to get a life, I know. Colour co-ordinating your table décor to compliment your interior is a gorgeous idea. I love the pink candles in hurricane lamps filled with sand and the white shells giving this Valentines table a gorgeous beach house effect.. 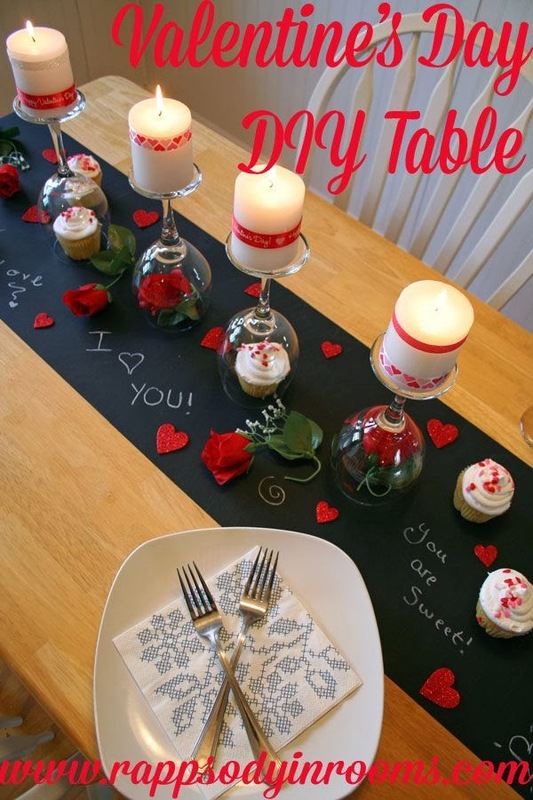 This chalk board table runner can be created using black card or paper. Personalise the runner using white chalk to write sweet messages of love. 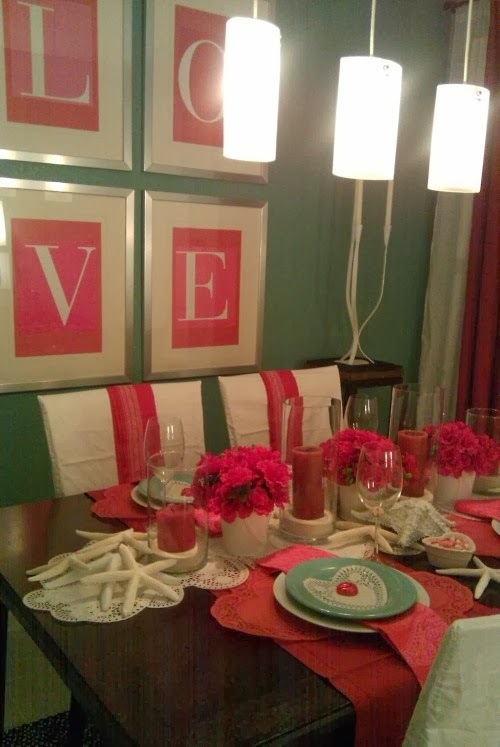 The wine glasses are also a cool idea, turning them upside down over red rose heads or Valentines cupcakes! 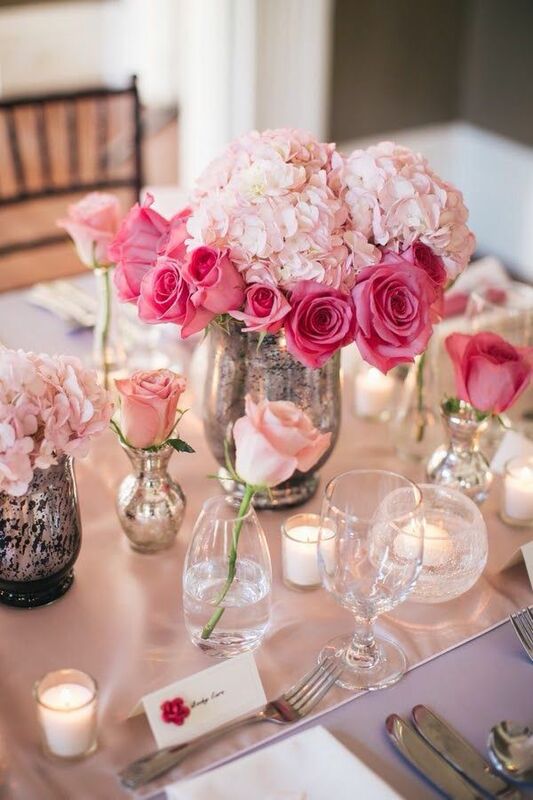 A really romantic table setting using a variety of vases and coloured roses. So beautiful and easy to recreate. Simple, classic and so easy to do. 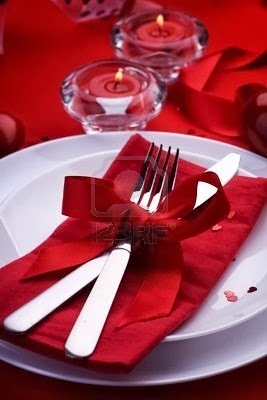 Using any ribbon of your choice tie around your cutlery and then position onto a neatly folded napkin. 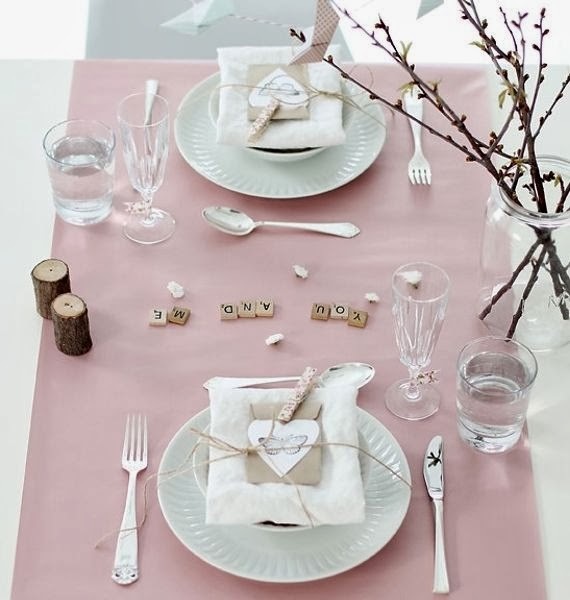 For a rustic themed table this Valentines, use twigs and branches to create small arrangements and tie string around your napkins. 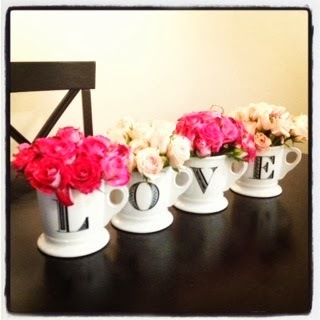 For cute touches use scrabble words to write romantic love messages to your Valentine. What are your plans for a romantic Valentines Day dinner?